In the world of computer data is more important and with increase in internet users it’s increasing very fast and hence now storing data is most challenging task.Now it is not good to store your data on single drive when you know your data is important,because in case of disk failure your data will loss and it will be a huge disaster.So in place of storing data on a single disk it will be intelligent decision to store your data on multiple disk such that if one disk fails your data is still safe on second disk. How to configure and Delete LVM in Linux. Since LVM provides us more flexblity in handling disk and managing data,so most of us prefer configuring LVM. 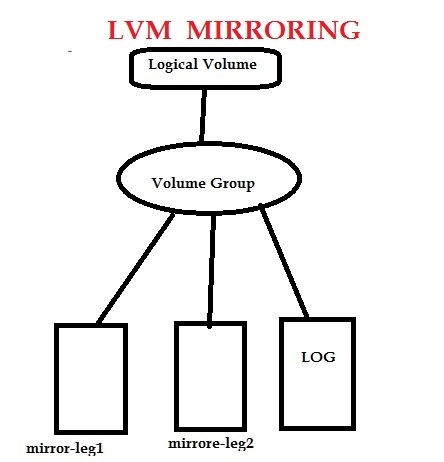 In This article i have mentioned how to create and configure mirrored logical volume.here we learn the fundamental concept of LVM Mirroring and also learn to create,manage ad maintain LVM mirror in Linux in few simple steps. While writing this article i assume that you already know how to create partition in linux.But if you don’t know or you a new user you can read our below article. Read:HOW TO CREATE PARTITION IN LINUX. Before learning how to create or configure mirrored LVM just have few words about mirrored LVM.When we are using the word mirror it means it maintains identical copies of data on different devices.So in Mirrored Logical Volume when data is written to one device,it is written to a second device as well and hence mirroring the data,which provides protection in case of device failure. So you will be excited to know what will happen if one leg of mirror fails? Answer is if one leg of mirror fails the logical volume becomes a Linear Volume and we can still access data. Note:In above diagram you can see a LOG sector which is used by LVMto keep track of which regions are in syc with the mirror or mirrors. STEP 1:After creating partitions create Physical Volumes using pvcreate. Now see physical volume attributes using pvs command. STEP 2:Now create Volume Group named “mirror_vg00” using above physical volumes. STEP 3:Now Create a Mirrored LVM. STEP 4: Create File system and mount and confirm mounting of Mirrored LVM. Now Learn how to Delete or Destroy Mirrored LVM. Step6:Remove volume group and confirm its removal. Step7:Check physical volume,if exist them remove it using pvremove and then confirm its removal. If you have any doubts feel free to ask through comment section. If you have any suggestion,You welcome! just mention your valuable suggestion through comments.